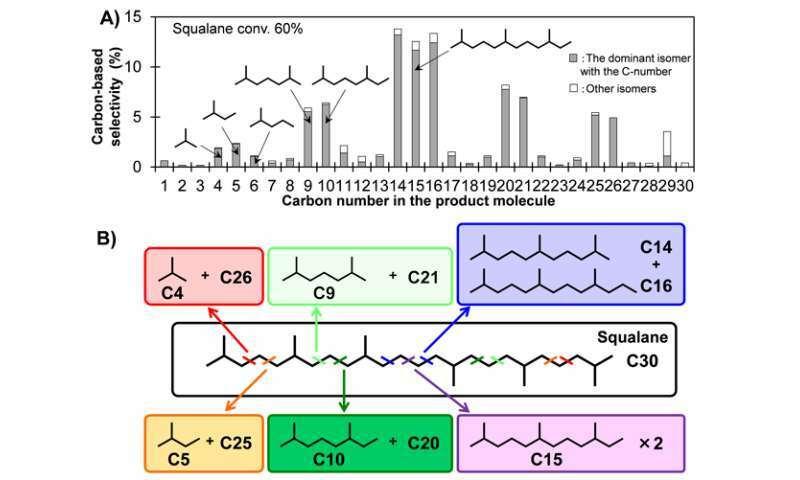 A new method of converting squalene, which is produced by microalgae, to gasoline or jet fuel, has been developed by the research group of Professor Keiichi Tomishige and Dr. Yoshinao Nakagawa from Tohoku University's Department of Applied Chemistry, and Dr. Hideo Watanabe from the University of Tsukuba. This study is part of a research project titled 'Next-generation energies for Tohoku recovery. Task 2: R&D on using algae biofuels.' The project attempts to make use of oil-producing algae in wastewater treatment. The result will help to expand the utilization of oil that is produced from wastewater. This new method uses a highly dispersed ruthenium catalyst supported on cerium oxide. Squalane—which is easily obtained from squalene—reacts with hydrogen over this catalyst, producing smaller hydrocarbons. The produced hydrocarbons are composed of only branched alkanes with simple distribution and do not contain toxic aromatics. These molecules have high stability and low freezing points. These features are very different from the hydrocarbons obtained by conventional petroleum refinery. The detailed results of the research will be published in June by Wiley VCH in their journal ChemSusChem. Biofuels have attracted much attention because of the declining amount of fossil fuels around the world and the rise of global warming. Some algae produce more oil than terrestrial plants, so they are a promising source of oil. Recently, Professor Makoto M. Watanabe and his team at the University of Tsukuba discovered a heterotrophic alga Aurantiochytrium 18W-13a strain (Fig. 1, left) which very rapidly produces squalene (Fig. 1, right) from organics in water. In March 2011, the Great Eastern Japan Earthquake hit the Sendai area, destroying the city's wastewater treatment system. In the aftermath, Tohoku University, the University of Tsukuba and Sendai City got together to develop a next-generation wastewater treatment system which cleans wastewater and produces oil simultaneously. Squalene is a 'heavy oil' range of hydrocarbon. It is currently gathered from deep sea sharks and used as a component of cosmetics. However, wastewater-derived squalene is not suitable for such sensitive uses and has little demand. Most uses of oil, such as gasoline and jet fuels, require reforming. This study focuses on the development of the reforming method most suited to algal oil. (A): Distribution of products in carbon number from squalane hydrogenolysis over ruthenium supported on cerium oxide catalyst. (B): Positions of C-C dissociation in squalane hydrogenolysisThe C14-16 component is suitable for jet fuel. C5-C10 is the gasoline-range. The distribution can be changed by the reaction time. Credit: Tomishige et al. The developed method uses a catalyst with cerium oxide support and ruthenium metal particles. The catalyst was prepared by mildly decomposing the ruthenium precursor at 300 degrees Celcius under inert atmosphere after impregnation. This procedure led to sub-nanometer-sized ruthenium particles supported on cerium oxide. Squalane, which is easily obtained by the hydrogenation of squalene, was treated with this catalyst and hydrogen at 60 atm and 240 degrees Celcius to produce smaller hydrocarbons. This reaction did not produce toxic aromatics at all. The C-C bonds located between the methyl branches were selectively dissociated, and branched alkanes were produced without the loss of branches (Fig. 2). Branched hydrocarbons are good components for gasoline and jet fuels because of the high octane number, low freezing point and good stability. Other noble metal catalysts were also tested, but the results were inferior to the sub-nanometer-sized ruthenium on cerium oxide catalyst in terms of activity and selectivity. This catalytic system makes good use of the squalene's branched structure, while conventional methods are suitable to straight-chain molecules in petroleum. In the future, this catalytic conversion method can be applied to real wastewater samples and other important algal hydrocarbons, such as those from Botryococcus braunii. While the catalyst research is a valuable achievement in and of itself - it does little if anything to improve the complete process economics that have thus far kept algae oil from being an economically viable or competitive fuel source. The energy costs that go into algae oil production and processing (algae growout, harvesting, dewatering, cell disruptions, oil separation, oil drying, and oil hydrogenation and storage) far exceed the energy yield coming out of the same algae oil. Algae oil was not close to being a commercial reality when petroleum was $150/barrel and it certainly isn't any closer at today's $60/barrel prices. Additionally, at significant scale, algae oil production requires NPK and competes with food markets for that same NPK. NPK is not only petroleum dependent, it's components are critical limited resources.. Algae may have some future minor role in petroleum products, but economically that day seems the distant future. that used taxpayer dollars to develop them.